Regardless of their address book's structure, most webmail providers and desktop email programs let you export your contacts to CSV file: CSV stands for " Comma-separated Values ", and is basically a plain-text file that contains headers on the first line; each line thereafter represents a contact. Each field (first name, last name, email address...) is separated by a comma. Microsoft lets you import CSV file containing contacts to import them into your "People" address book. This tutorial shows you how to import a generic CSV file. Separate tutorials will explain how to import contact files from the most popular webmail providers (Google's Gmail, Yahoo Mail, AOL Mail, etc.) We'll also show you how to handle duplicate contacts. 1 Login to your account and go to your inbox. 2 Click on the grid icon (top left) and choose "People". 3 Click on the "Start import" button at the bottom of the page. 4 Click on the "Other" link. 5 Pick the CSV file on your computer and click Upload. 6 Follow the duplicate contacts / merge prompts. First, sign in to your Hotmail account; then, click on the grid button (top right corner of the page), and choose "People" from the dropdown menu: this is how Microsoft now calls your address book. Now click on the orange Upload button: as soon as you do, Outlook.com will start parsing through the CSV file to detect any duplicate contacts, or conflicts of any kind. Within, typically, a few seconds, you'll see the results of your import displayed on the screen, with the " We found [x] contacts. Duplicate contacts aren't included and won't be imported. During import, new contacts will be added and existing contacts will be updated. We're only showing you part of the info for each contact, but we'll import it all " notice at the top - briefly, existing contact's information will be updated as needed, and new ones will be added. You'll now get the final " Import successful " confirmation screen: if you click OK, nothing more will happen. 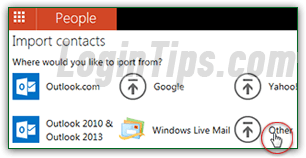 If you click on "Clean up contacts", however, Outlook.com will check your entire address book - not just potential duplicates from the import process). In our case, there are three contacts whose information allows Hotmail to determine that they might be duplicates (and in this case, Microsoft was correct on all three counts!) Check (merge) or uncheck (ignore) the duplicate contacts you want to merge, and click on the "Clean up" button at the bottom.